Note: It will be shipped on April, 2019. There are about million different kinds of travel adapters in the market with inconsistent quality and many different problems. They are often too bulky, don’t fit properly, fall out of the socket, take up too much space, block the socket beside them, unreliable, poor quality with no guarantee, not convertible, or only converts plugs but not voltages etc. 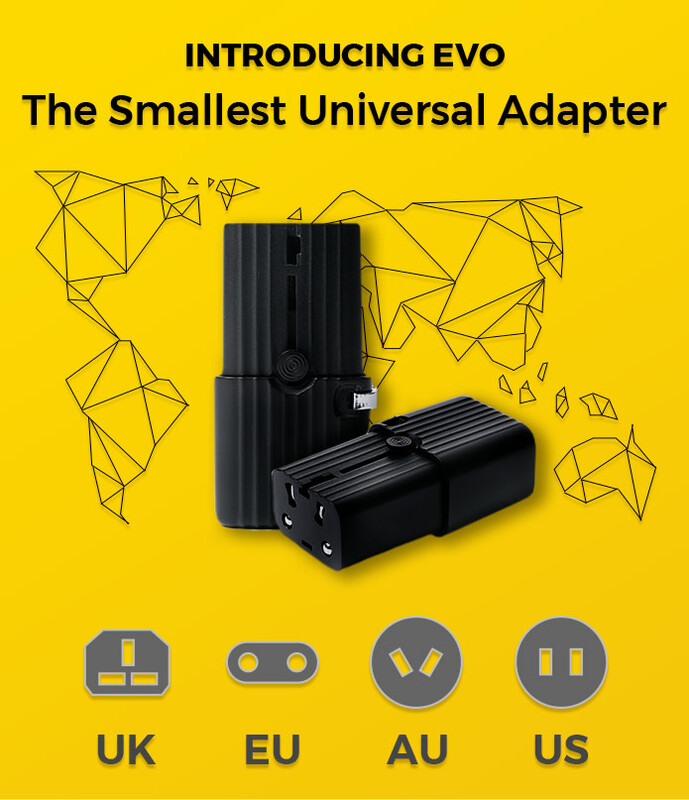 By listening to customers, integrating the market needs and creating insight into the market situation, we have designed this smallest universal adapter - Evo. We focus on innovations and guarantee its diversity, rationality and security. 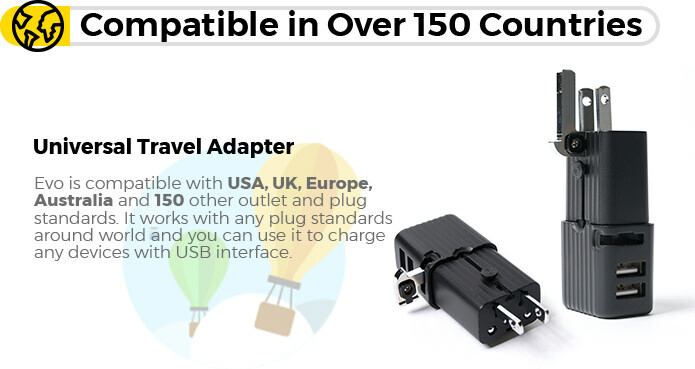 Driven to provide everyday travelers with the perfect travel adapter in the highest quality. Evo is designed and engineered for ease of use, portable and cost-effectiveness in mind. We collaborate and maintain a long-term partnership with AT&T and Phillip etc, hence we are highly confident in the field of security and design. Use fireproof and environmental protection PC94V0 material to make sure safety using. This material is heat resistance but also durable and light. 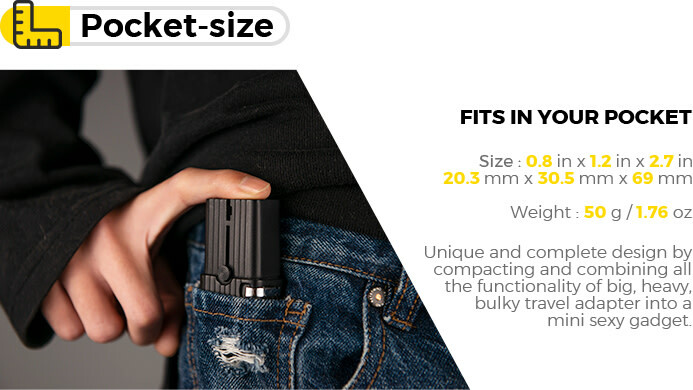 This ultra-thin universal adapter can fit easily in a pocket, bag or backpack. You can use Evo at any time in anywhere no matter whether you are traveling around the world, in the hotel, in the office or at home. With many years of experience in the production of electronic appliances, we are very familiar with different types of adapters in various countries. We have been thoughtfully designed from the ground up to include details that aid in daily journeys. And finally come up with this prototype - the lightest, smallest and user-friendly universal travel adapter — Evo — Compact but Powerful! For many, having many electronic devices is a critical part of having a great travel experience and an integral part of daily life. 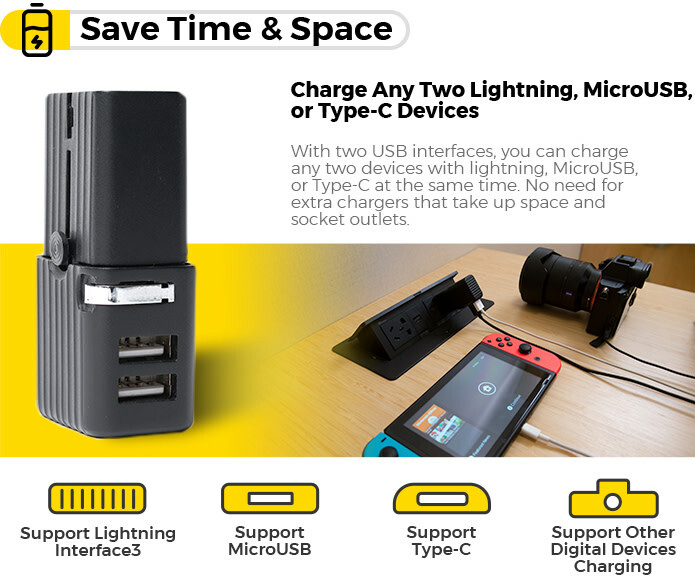 Travel around the world and lighten the load with our smallest clever Universal Travel Adapter Evo, which is perfect for all your travel essentials. 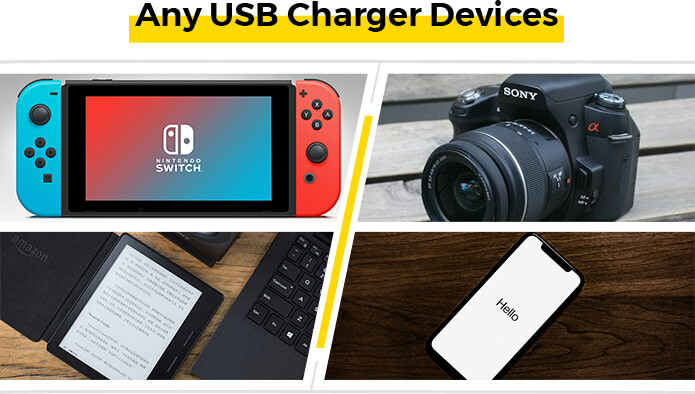 Its ultra slim, compact, lightweight, portable duel port design allows you to fast charge 2 devices (lightning, MicroUSB or Type-C) at one time easily. Also compatible to accommodate power supply sources in more than 150 countries which works perfectly with any plug standards. Evo is made of an excellent fire-resistant, overheat and cold resistant material PC94V0. 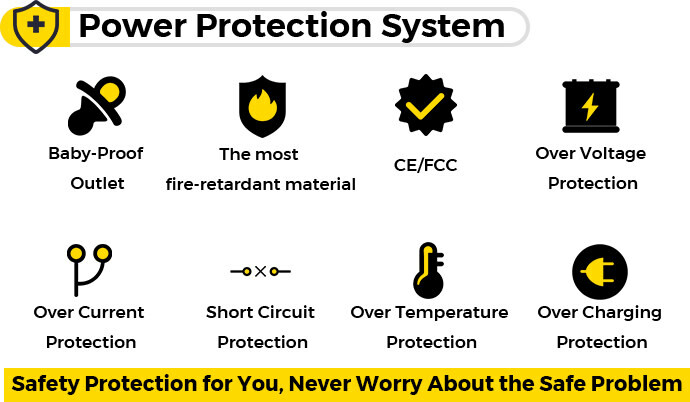 And its multiple safety protection systems are designed with safety shutters, surge protection, over-heated, over-current, over-voltage, output short-circuit, over-load protection provide ultimate protection of connected electronic devices and guarantee the safety of usage. Over thousand and million times of test, Evo has passed CE and FCC compliance testing. Certifying Evo assures our customers that we meet strict guidelines for compatibility, and standards compliance for product safety, energy efficiency, and environment-friendly. We are committed to maintaining the best quality of our products.